This custom installation serves as a private artist studio for an existing client. An area on the property was selected that already had existing utility services: an unused hot tub deck to the south of the home. Because of the visibility of the building site from the living area, our client requested that the studio mimic the home's appearance. This detached shower house serves occupants of an adjacent cabin with toilet and washing facilities. Solar energy powers the electrical needs including the structure's water pumping system. The shower and floors are formed with bluestone in an organic pattern with stream stones embedded to mimic a meandering stream bed. The whimsical "outhouse" seat conceals a real, working toilet to maintain a sanitary condition. The services are completed by a highly custom vanity utilizing a bluestone counter, live-edge wood bordering, salvaged Fir from a deconstructed grain silo, and branch door pulls. One of the ways to surely enjoy your log home or cabin more is to have room for more friends and family to come and visit! In their travels, our clients had visited a place which had a dry sauna with a cold pool next to it and asked us if it was possible to incorporate this same idea near their cabin. Terry began to visualize possibilities and make suggestions…they liked what they heard, the project had begun! The goal? A new, safe tree house for the grandkids to play in when spending weekends at the cabin, a place they could call their own. Creasey Log Homes (CLH) proceeded to tear down the old structure and prepare the foundation for a tree house built to CLH standards. This beautiful pavilion was born out of a vision for a grander outdoor living experience and to dramatically facilitate the entertainment of guests. The outdoor structure is of post-and-beam construction with flared posts for a distinctly craftsman touch. Ambience is enhanced by a ventless gas fireplace also serving to take the chill off on cooler days or nights. The following work began as a dream to create a more functional and beautiful series of spaces around the home. The driving idea was to create something "magical" of the landscaping to reflect the upgrades previously done to the interior of the home. 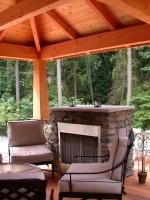 This solarium represents an addition to a cabin previously built by Creasey Log Homes. It's purpose is to provide additional space as well as collect heat to be passively distributed to the cabin to regulate heat in cooler months. One of the features making it unique is the artistic representation of animal prints in the stone floor paying homage to local wildlife. LED dot lights embedded in the floor provide a soft upcast highlighting the natural wood, as well. The project extended to the exterior with stone hardscaping and steps down to additional planned social spaces. The owners of this Kent, Washington log home were experiencing problems associated with high weather exposure due primarily to inadequate roof overhangs. The width of the balcony was reduced to provide greater protection from the elements. A sloped, waterproof membrane was applied, directing water to a full length gutter for removal. The log railings were replaced with a painted metal version to minimize long-term maintenance. Long-valued clients of ours from Woodinville, Washington contacted us about a small collaboration with Pete Nelson of Animal Planet's Treehouse Masters. 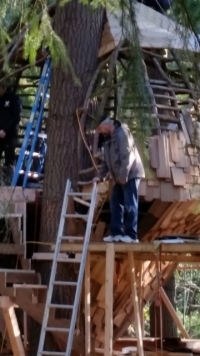 Pete was commissioned to construct a treehouse with the concept of a bee hive. 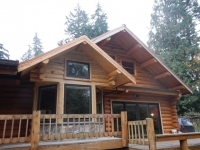 Creasey Log Homes was contracted to install branch railings to the stair set. The episode initially aired January 23rd, 2015 on Animal Planet. The goal of this project was to provide a complete covering between the home and garage in a unified way. The existing, low-headroom porch roof was first removed and then connecting structure constructed. A clerestory concept was introduced to further the barn theme as well as introduce a large amount of natural light. To complete the package, matching roofing and gutters were installed to manage the Northwest rainfall.